STUNNING VIEWS!!!!! Gorgeous sunsets in front & backyard! Private entrances from Master Bedroom, guest bedroom & dining room to expansive balcony with patio couch set to watch the view while you chill out and have a glass of wine or beer, cocktail(s)? Game room included with a bar, pool table, ping pong, darts, games, gas fireplace, flat screen Smart TV! The location is beautiful and quiet. House has a honeymoon suite with full bathroom, microwave, mini refrigerator, coffee pot and more! Great for second couple, in-laws, etc.. Has a private patio! We are a family with 6 children. We have owned property in AZ since 2004. Sky Bliss is our 2nd home. We love it so much that we want to share it with you when we are not there. We chose this house because of the location! The view is spectacular! This home has a nice floor plan! It's very comfortable and tranquil. We come here to relax. Our kids love this house! The especially love playing pool and ping pong in the game room while watching a movie. Gorgeous sunsets! Nice tranquil location. Please do not over load. Gas dryer - please remove lint after each use to prevent fire. 1 gas burner fireplace in living room. 3 electric fireplaces; 1 in master bedroom, 1 in garage, 1 in lower bedroom #4. All provide heat and beauty. Garage is converted to a game room for your enjoyment. The parking is on the driveway (Enough for 2 vehicles) and on the street. Game room. Pool table, ping pong, bar, darts, sitting area. Electric fireplace and Flatscreen TV, BlueRay DVD player. Yes, enough towels for everyone! Gas fireplace. Flat screen TV, BlueRay DVD player. Books, games. Brand new. Ice maker, filtered water maker (Inside refrigerator). Brand new! 5 burner gas range. Hood over oven. **Fire extinguisher, medical first aid kit, flash light located here. Spacious pantry! Everything you would need to cook a nice meal. Kitchen is well stocked with everything you need to cook your nice meals. There is a crock pot, Stew pots, dutch oven, roasting pan, extra dishes and silverware! Appliances are all new! Beautiful bench table set. 2 bar stools. Seats approximately 8-9 total. Many new books located in Living room. Many board games, pool table, ping pong, dart board. Can be accessed on the Flatscreen TVs. 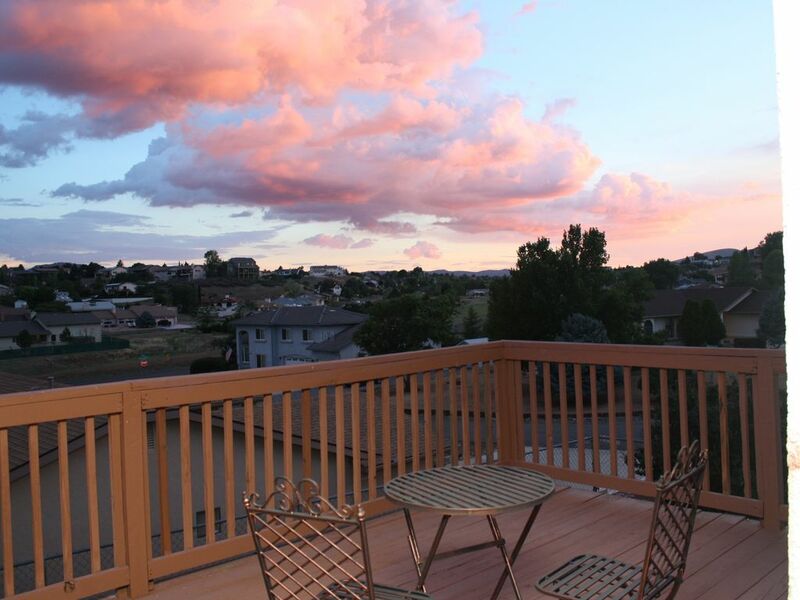 View of beautiful sunsets from Rear Balcony and Front porch. There are steep steps all around this house. The lower bedroom has 1 step to room. We were in town for a volleyball tournament. This home is very comfortable,spacious and close to many eating establishments. It was also near all of the venues we were playing at. The only issue we had was not being able to use regular TV. There were instructions but we were technology challenged. It wasn’t a big deal since there were many games that our kids could play as well as the game room. We will definitely stay again. Thank you for sharing your home with us. Awesome cozy home away from home! We enjoyed our stay in prescott valley so much! Your home is beautiful, cozy and was perfect for our group! Thank you so much! We hope to see you again next time you are in Prescott Valley! We loved staying in this house. It was very beautiful and comfy. Our 11 yr. old loved the pool table! Thank you for allowing us to stay in your home, we will definitely be back. Very clean, organized, and convenient location! We will definitely stay here again the next time we visit Prescott! I absolutely loved this vacation home. It was clean, well equipped, and quite roomy for my family of 7. My kids immediately gravitated to the game room for ping pong but we also made it through several rounds of Monopoly at the dining room table! This house is perfectly situated for a beautiful mountain-view sunrise, or a quick drive downtown for dinner. It is also centrally located to many of Arizona’s popular tourist sites. Carolyn has made it incredibly easy to enjoy quality family time at this property. She offered prompt, considerate responses to my questions and was always incredibly kind. I would recommend this property 100%, and hope to be able to rent from Carolyn again in the near future. Our group had a great stay in this beautiful home. In Sedona (1 hour away) there is shopping, hiking, massage, jeep tours, rock climbing in Sedona. In Jerome (1 hour away) there are Haunted Tours, wine tasting, shopping, museum in Jerome. Beautiful drive from Prescott Valley to Sedona. About 1 hour drive. Phoenix and Scottsdale are about 1 hour 15 minutes away. Museums, shopping, golf and more! Go to downtown Prescott and experience Whisky Row!